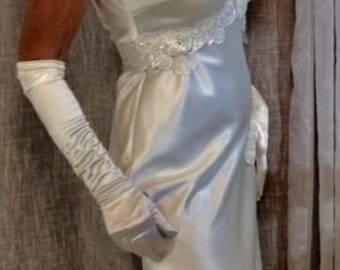 Elegant couture wedding dress, also great for many other special occasions. The tulle train is easily removable. The flower will stay attached. 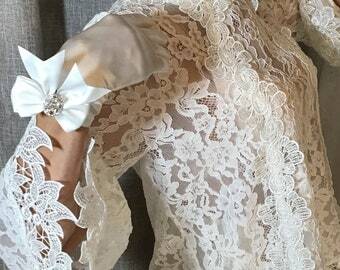 Perfect attire for a mother of the bride or just a wedding quest. Fully lined. 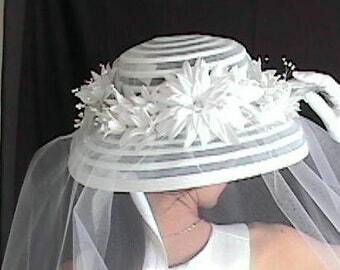 It is off white; the lace ribbon trim with clear sequins. Please note the accessories (hat, gloves) are not included in this sale. There's a limited selection of designer hats available in our store. Please check them out. This dress fits best US sizes 4-6. Stunning! The best dress I ever had. It fits perfectly and the quality of the fabric is much better than I expected. 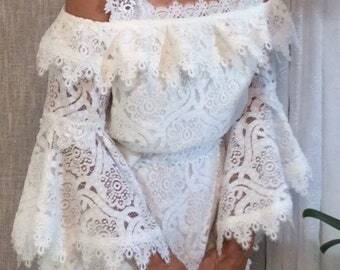 Love all the little details and the lace trim. I really feel beautiful in this dress! Formal Off White Maxi Dress. Wedding dress. Bridal attire. Ivory long dress with detachable train. Designer wedding dress. Formal couture.